Lolly lolly lolly, get your theories here! Lolly lolly lolly, get some theories here! Come on down to Lolly's, get the theories here! the gub'mint is coming for you! Remember Schoolhouse Rock? I know most of you do. I do. (obviously) But then again, I remember Timer. (It's time for Timer! That orange circular guy that was...I don't know...supposed to be cheese, maybe? Taught you about healthy snacks like cheese and cracker wagon wheels? Pouring OJ into an ice cube tray and sticking in toothpicks to make popsicles?) And I remember when super heros advertised Hostess snack cakes in the comic books. I found that picture and decided I HAD to use it for a Thursday post. 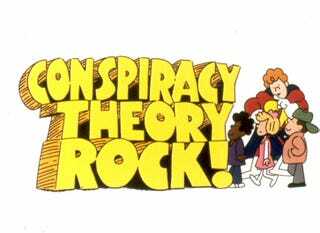 Especially considering that around here, Thursdays are Totally Trippy Theory Thursday's! It's time for me to tell you all about a theory that real people believe. Around the same time that Schoolhouse Rock was showing on tv in between the Saturday morning cartoons, something else was happening. I'm old enough to remember the news coverage of it. I also remember being glad that I didn't live anywhere near Atlanta because my best friend at the time was an African American. From July 1979 until March 1981, 28 African Americans were murdered in and around the city of Atlanta. Most of the victims were children not about the same age as I was. The people were killed in a variety of ways, although the most common method of death was by strangulation/asphyxiation. In March of 1981, as 23 year old, Wayne Williams, was arrested for the killings. He was tried and convicted of three of the murders, and the rest were attributed to him. In 2006 some of the cases were reexamined. DNA testing was done, and and the tests on dog hair showed Williams owned a dog that had a 1 in 100 chance of being present. Human hair was also tested. The results showed a mitochondrial DNA match between the hair found at the scene and Williams. While it's not a 100% match, it is a 98% match showing Williams was the killer. That's the facts. Now we move on to the theories. Yup, I said theories. Because there's more than one. The next theory states that the people were killed by the CDC while they were researching the effects of interferon. Interferon is a series of glycoproteins that a cell that has been infected by a virus will secrete to tell all the cells around it to raise it's defenses against the virus. Interferon is part of the natural immune system, and it is still used today to treat certain auto-immune diseases like MS. This theory suggests the victims were intentionally infected with a virus, then injected with interferon to see if it would kill the virus. When the testing was over, the victims were killed in a way that made murder obvious so no one would look too closely for any other causes. And finally, there is the theory that says rich white men did it. Well, they didn't do it themselves. They hired someone, (Williams), to do it for them. The reason was, the rich white men had funded a group of scientists to develop two things; a cure for cancer, and a youth serum. To make an effective cure and serum, they needed a ingredient that was difficult to find. The foreskin of a young black male. Williams, (who has been suspected of being gay), was their choice for foreskin collector. The first, ok...I can see that one kind of. Let's just say that if it turned out to be true, I wouldn't be surprised. The second, maaaaybe in North Korea or China. But not in the states. Again, there are people out there who believe all three of these theories. I don't, but then, I'm also a rational human being who doesn't believe in off the wall theories. Now if you'll excuse me, I have an appointment to have dinner with the Boston Yeti and his pet Chupacabra.